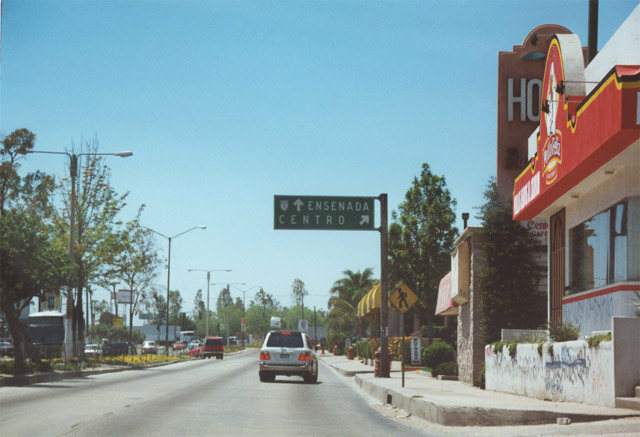 Photos covering Mexico 1-D, Mexico 1-D in and around Tijuana from a roadtrip in May 2001. 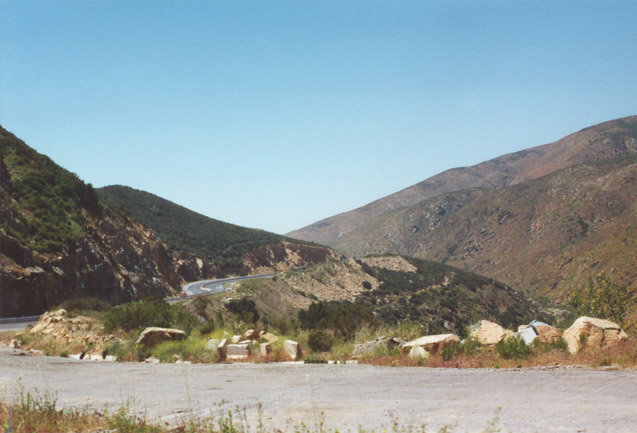 Thanks to Don Hagstrom and Kevin Trinkle for making this trip possible. Most of the land north of the International boundary where Mexico 1 crosses from Tijuana to San Ysidro is undeveloped. 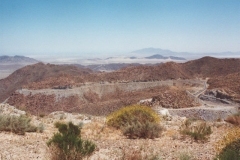 This is because much of the land in the United States adjacent to the border is part of Border Field State Park. 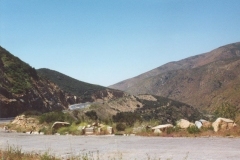 The state park encompasses the Tijuana River Valley, which is mostly wetlands and foothills as well as coastal estuary. 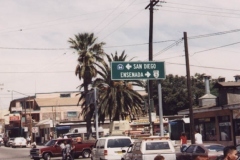 The city of Tijuana, meanwhile, sprawls all the way to the border fence, offering a major contrast between the United States and Mexico at this point along the border. 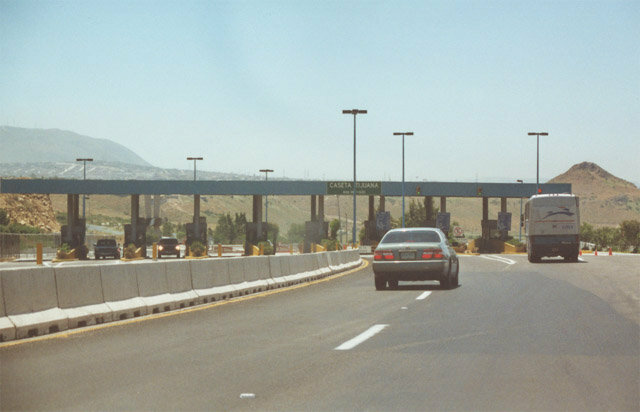 At this point, Mexico 1-D is no longer a toll road, and it rapidly transfers onto Tijuana city streets. The connection from there to the border crossing and Interstate 5 is a bit convoluted, as one must navigate city streets to reach the border. 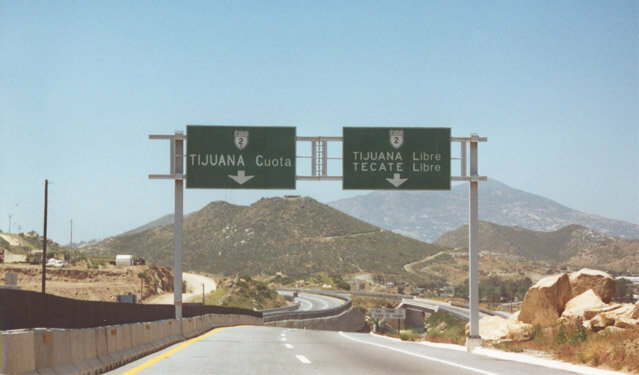 There was a proposal to construct a new border crossing at approximately this location into the United States, but the environmental sensitivity of the Tijuana River Valley and Border Field State Park prevented such a route from being constructed. 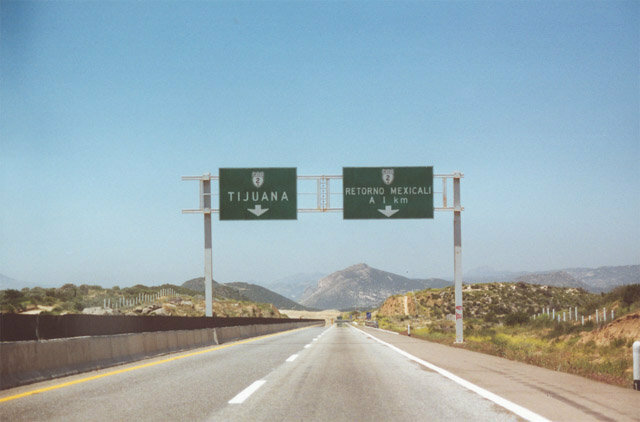 Kilometers along Mexico 1-D increase from Tijuana southward. The Zero kilometer post is the near the interchange with Mexico 2. 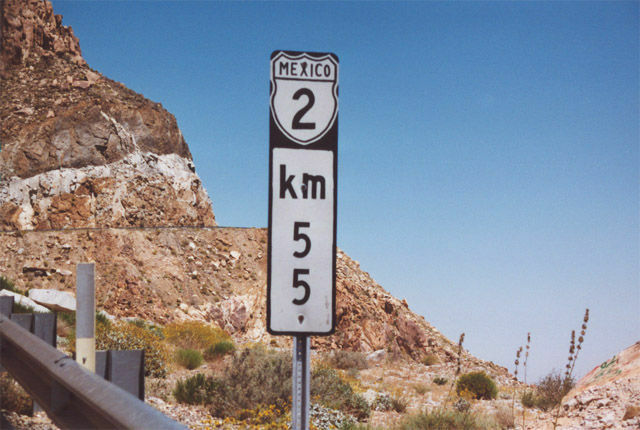 Generally, there are not many reassurance shields, so the kilometer posts acts as reassurance markers. The only reassurance markers for Mexico 2 between San Luis Colorado and Mexicali appear on kilometer posts, and on the overhead signage at intersections. 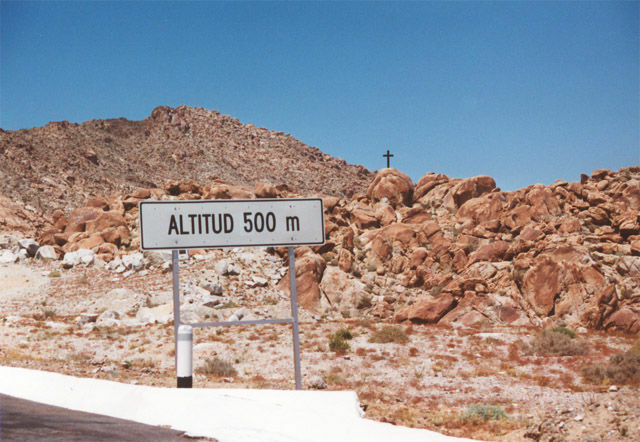 Kilometers increase from east to west. 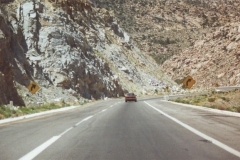 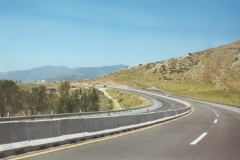 Westbound Mexico 2 / 2-D along La Rumorosa Grade. 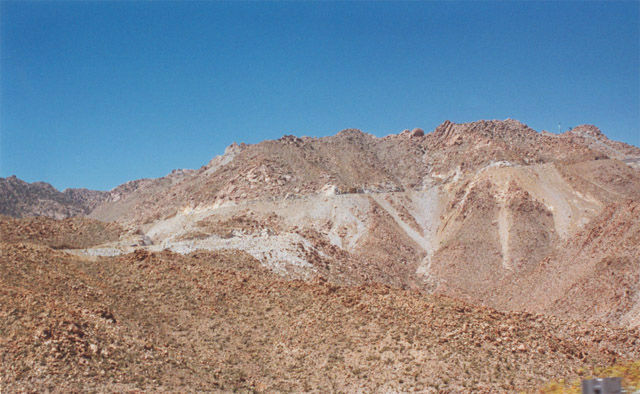 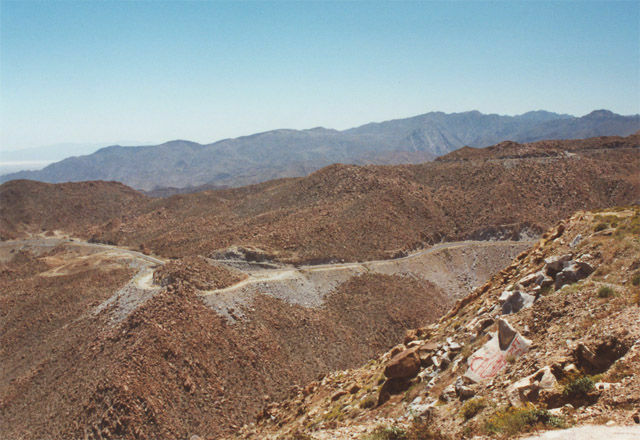 Easterly view of Mexico 2 and 2-D ascending La Rumorosa. 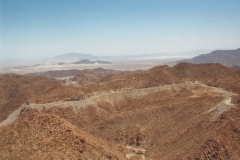 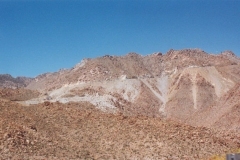 Looking east from La Rumorosa toward the low desert and Mexicali. 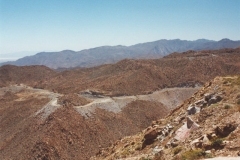 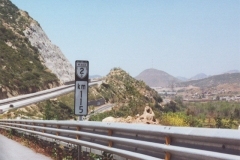 Mexico 2 and 2D make a number of sharp curves through mountain cuts on the route across La Rumorosa. 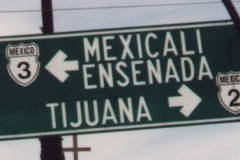 Mexico 2-D west at kilometer post 55. 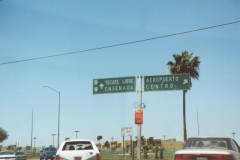 These kilometer posts are not consecutive with those east of Mexicali along Mexico 2. 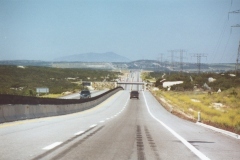 View of the westbound lanes looking east from the rest stop near kilometer post 55. 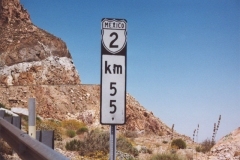 What used to be Mexico 2 was incorporated into one of the roadways for Mexico 2-D. 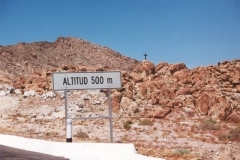 Typical elevation sign used in Baja California Norte. 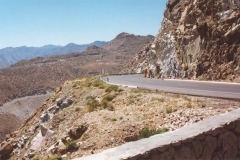 Mexico 2 / 2D climb to an elevation of 4,000 feet from sea level on the trek across La Rumorosa Grade. Falling rocks signs along Mexico 2-D. 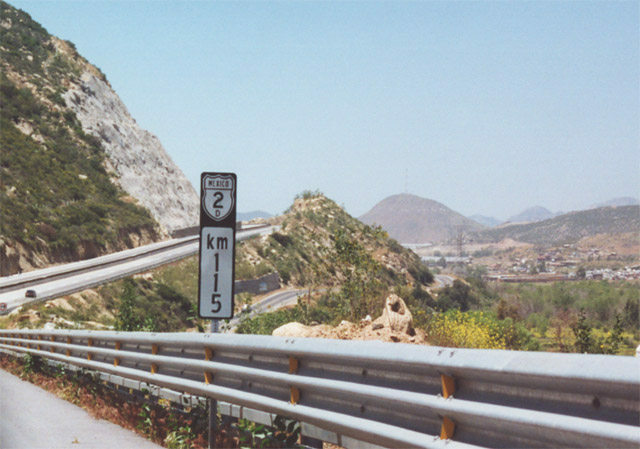 Westbound Mexico 2-D and Mexico 2 split at top of La Rumorosa. 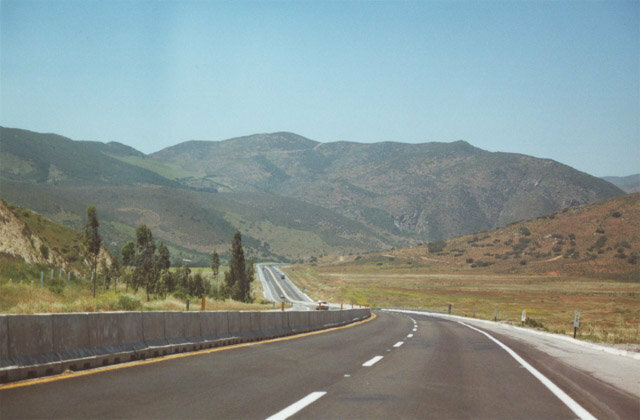 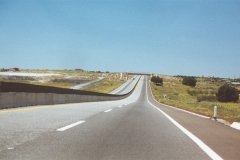 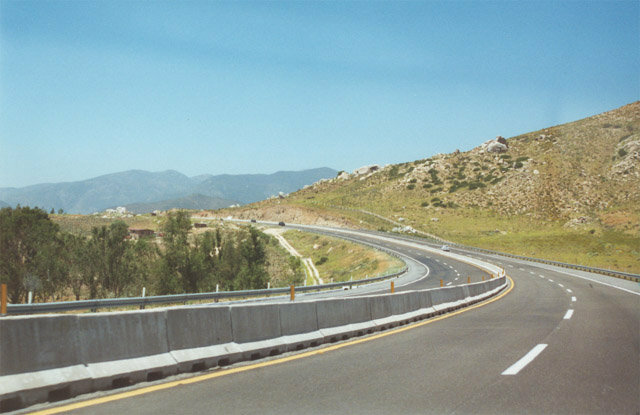 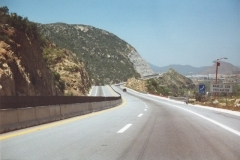 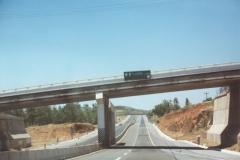 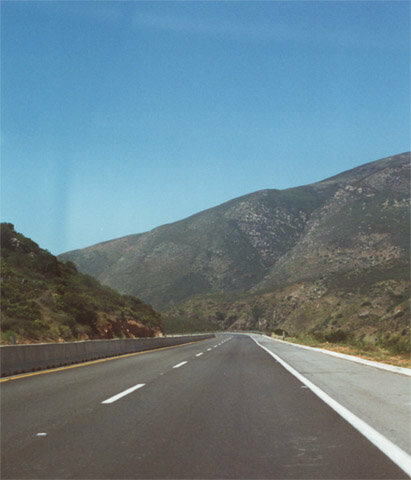 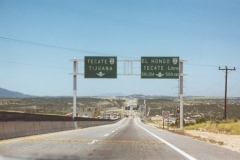 Both routes continue to Tecate, with Mexico 2-D bypassing a two-lane stretch of Mexico 2. 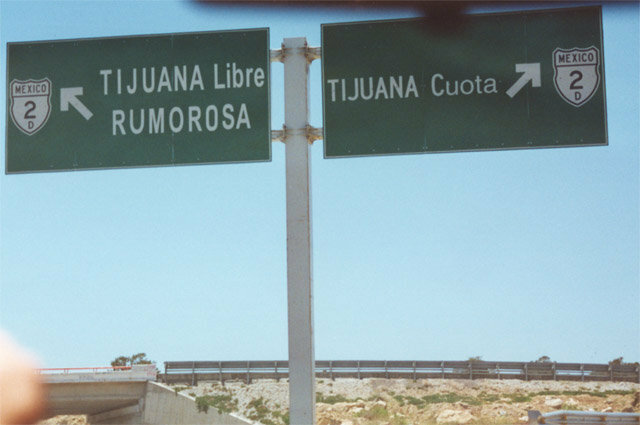 Signage for Mexico 2-D to Tijuana after the La Rumorosa summit. Approaching the U-turn ("Retorno") at the top of La Rumorosa along westbound. 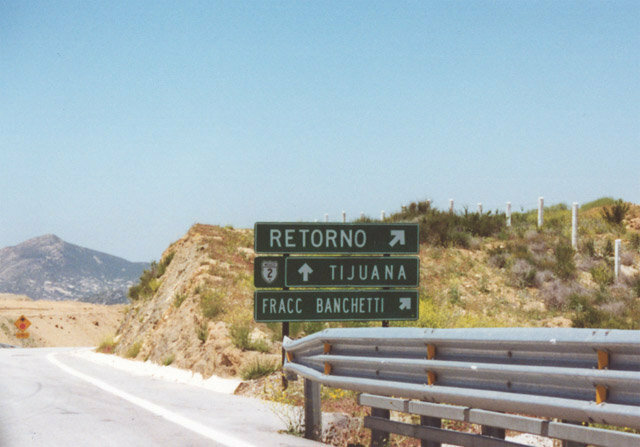 The forthcoming exit also connects to Fracc Branchetti and Mexico 2. 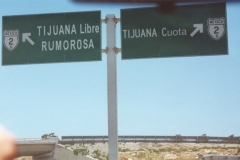 Mexico 2 leads to the town of Rumorosa and provides a free alternate route to Tecate and Tijuana. 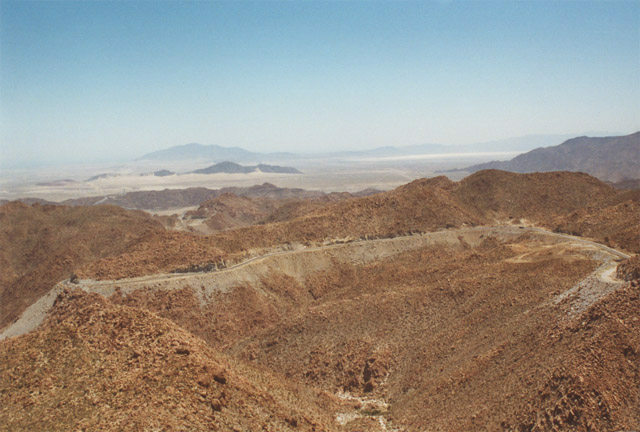 Mexico 2-D straightens out across the high-altitude desert, which increases in agricultural uses due to higher annual average precipitation. 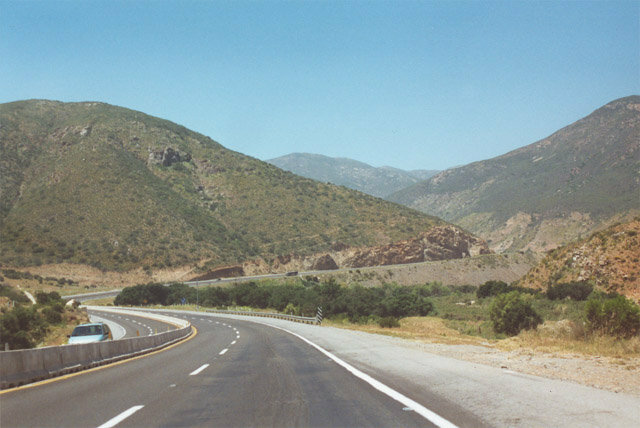 Mexico 2-D, like parallel Interstate 8 to the north, crosses beautiful mountainous terrain between La Rumorosa Grade and Tecate. 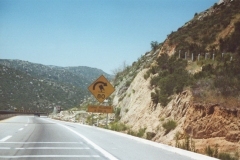 Drive with Caution sign along westbound Mexico 2-D. 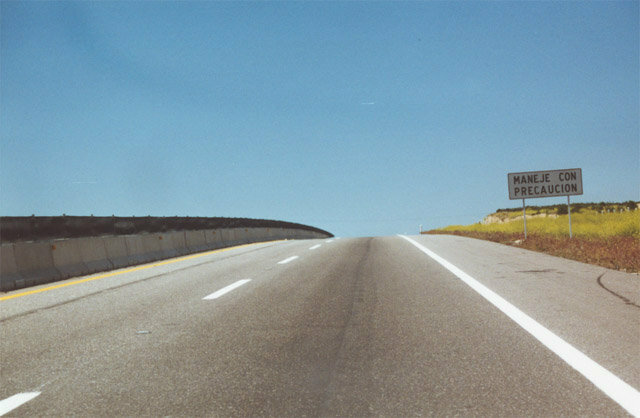 Entering a sharp curve along Mexico 2-D west. 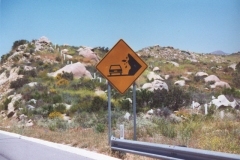 The warning sign is very similar to the ones used on California highways. 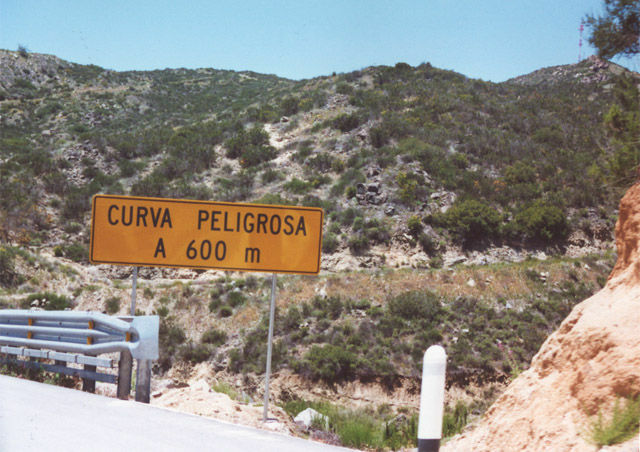 The warning sign reads "Maneje con Precaucion," which means "Drive with Caution." 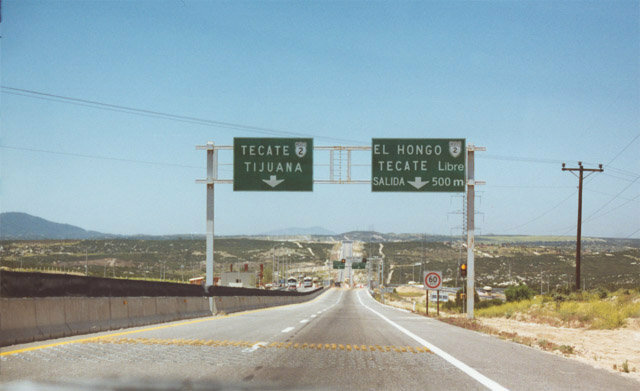 Approaching Tecate and Mexico 2 on Mexico 2-D west. 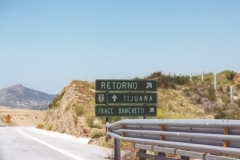 Mexico 2 acts as a business route into Tecate from the toll road. 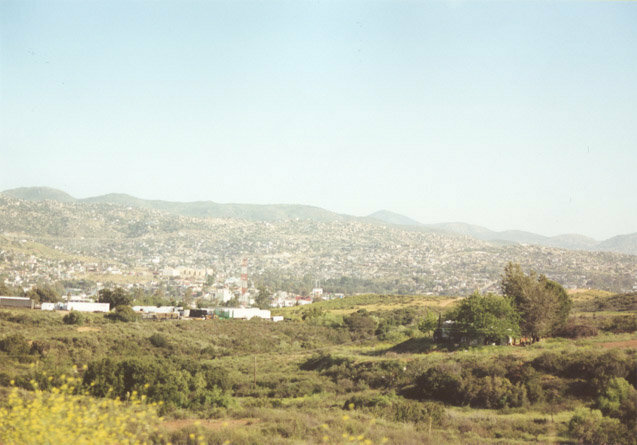 Tecate spreads to the north in this view from Mexico 2-D.
Mexico 2 meets Mexico 3 in Downtown Tecate. 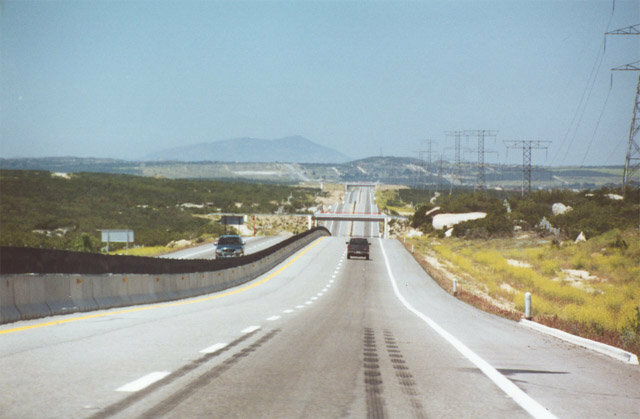 Mexico 3 travels south to end at Mexico 5 near San Felipe. 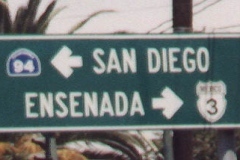 Mexico 3 leads north into to the United States from here (via California 188) and southwest to Ensenada. 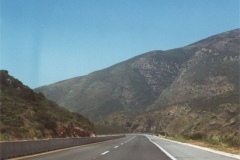 California 188 extends north from Mexico 3 and the United States border to California 94. 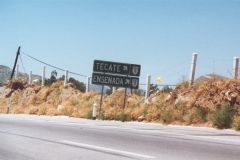 Westbound Mexico 2-D at the main exit into Tecate with Mexico 2 to Mexico 3 south. The junction was the the eastern terminus of the toll road before the extension over La Rumorosa to Mexicali was constructed. 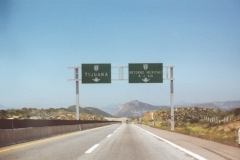 Westbound Mexico 2-D at kilometer post 115 near Tijuana. 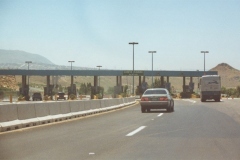 The last toll plaza along Mexico 2-D west. This was located in the general vicinity of the planned Tijuana 2000 Beltway. Welcome to Tijuana (Worldwide Capital of the Television) sign posted at the west end of Mexico 2-D. Home to several "maquiladoras," which are generally manufacturing facilities for foreign companies, this section of Tijuana is a major manufacturing location. 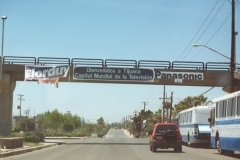 Tijuana was a major manufacturer of televisions. Mexico 2 approaches Baja California Route 1. 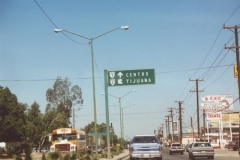 Most signage along Mexico 2 references Downtown ("centro") or Mexico 1-D. 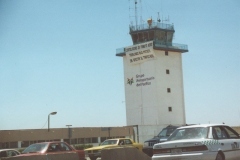 The control tower for Rodriguez Field, which is Tijuana International Airport. 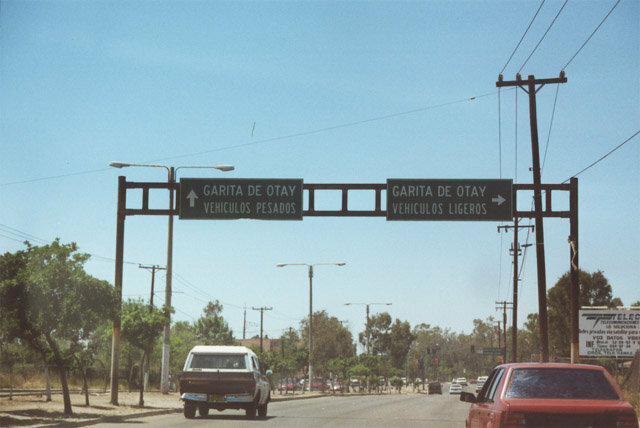 Signs for the Otay Mesa Border Crossing on Mexico 2 in Tijuana. 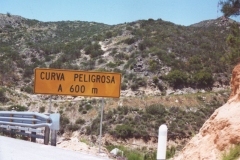 "Vehiculos Ligeros" are light vehicles, such as cars, and "Vehiculos Pesados" are heavy vehicles, such as trucks and buses. The forthcoming crossing connects with California 905 and 125 beyond the border. 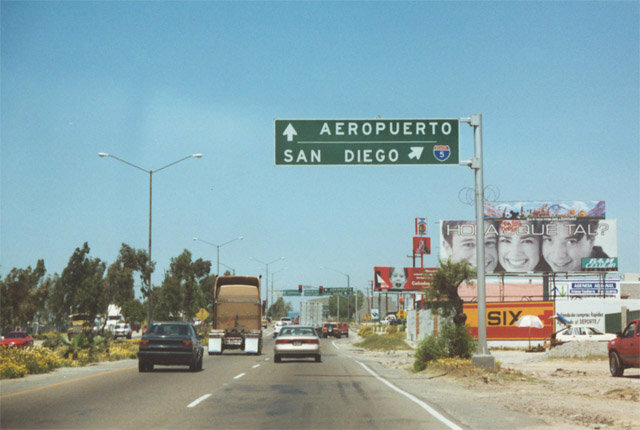 Overheads for Interstate 5 and Tijuana International Airport along Mexico 2 west. 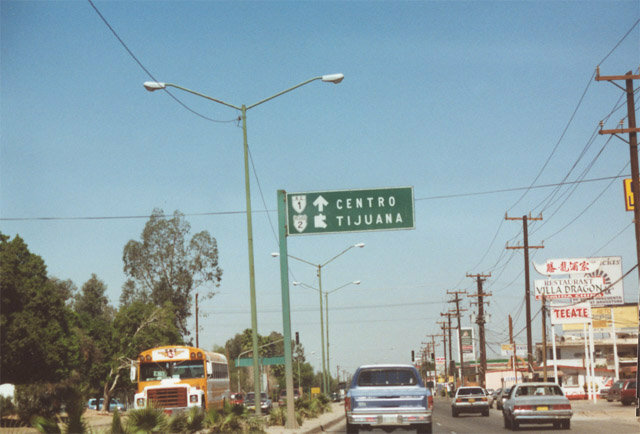 I-5 shields are commonly used in Tijuana, especially along roads located close to the U.S. border. Guide signs directing motorists toward Mexico 1 and 2 on a local road in Tijuana. 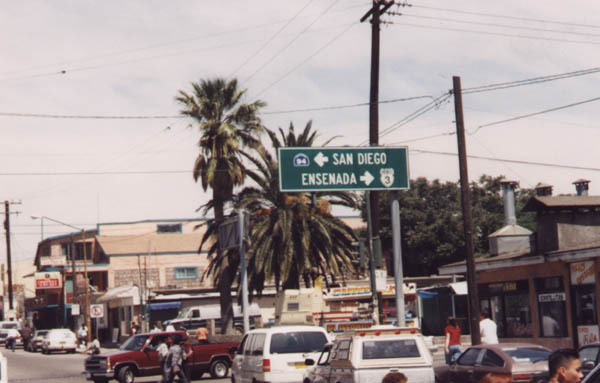 Signage for Mexico 1 to Ensenada and Downtown Tijuana ("Centro"). 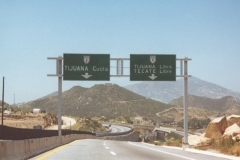 Occasionally signs for Mexico 1 will differentiate between "Cuota" and "Libre," which means "toll road" (Mexico 1-D) and "free road" (Mexico 1).